Monmouth County's newest full service Holiday Inn Hotel located just 10 minutes from the Jersey Shore and PNC Arts Center, in Hazlet, NJ. 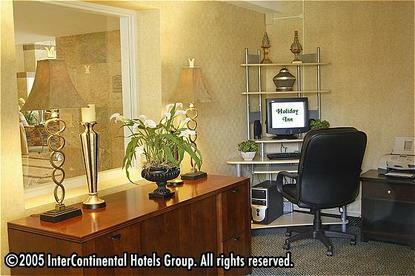 We offer all the comforts of home and all the services that make every stay an absolute pleasure. Featuring 121 beautifully appointed guestrooms including 2 executive rooms and one two-room executive suite with whirlpool. In addition to complimentary high speed Internet access, all of our guestrooms provide all of the thoughtful amenities you have come to expect from Holiday Inn Hotels. Our 9000+ sq. ft. of flexible meeting space accommodates corporate functions as small as 10 people or social functions as large as 500 people. Our professional catering experts are always available to make your corporate or social gathering a memorable experience. The Bayshore Bar and Grill makes for a convenient dining experience, with an array of American fare that will delight the most discerning pallet and please the pocket book. In-room dining is available for breakfast, lunch and dinner. A Lounge tis available. We offer a state-of-the-art fitness facility, seasonal outdoor heated pool, and business center with high-speed Internet access. Centrally located in the Bayshore region of NJ, we are a great stop over when frequenting such attractions as: Sandy Hook, PNC Arts Center, Freehold Race Track, Keansburg Amusement and Water Park and Monmouth Racetrack. Come see what the Holiday Inn Hazlet is all about This hotel is committed to providing accessible facilities under the American Disabilities Act. If your accessibility needs are not met, please contact the Hotel Manager on Duty. Should you require additional information regarding accessible facilities for guests with disabilities, please call 1-800-Holiday (U.S. and Canada) or contact the hotel directly. For the hearing impaired, TDD service is available at 1-800-238-5544 within the U.S. and Canada.